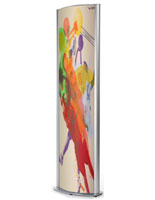 Media Size: 24" x 72"
Double-sided, convex-shaped stand holds (2) 24"w x 72"h posters, creating an imposing presentation. 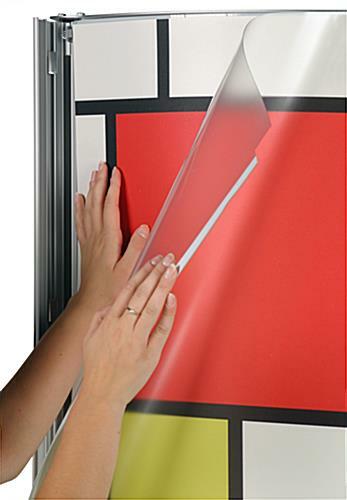 Protective lens attaches to left rail bar to swing open like a door, allowing users to use two hands for inserting posters. Posters held in place with two clamps at top of display, even when rail bars are snapped are open. Easy snap open rail bars for quick graphic changeout. Please Note: This unit ships unassembled. 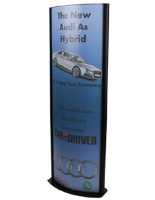 Totem poster stand - An attractive stand display at an inexpensive price! The totem poster stand, also known as a free standing poster display is a cost efficient way to present graphics in an attractive manner. 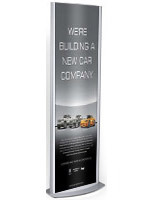 Unlike traditional poster displays, the totem poster stand features a convex curved sign holder, adding a touch of style to any marketing display. 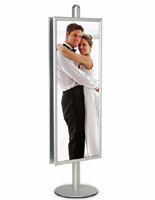 Totem poster stands are free standing and are great floor displays. The totem poster stand accommodates any 24" x 72" graphic and is double sided, allowing you to showcase two graphics in the same stand display. The totem display is made from high quality anodized aluminum and includes a weighted metal base to keep the stand display from tipping. The 26-1/2"L x 13-3/4"W base also includes rubber footing to prevent scratching of floor surfaces. 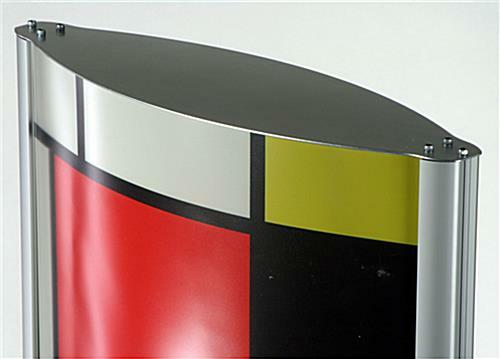 Once assembled, a stiff sheet of PVC (included) is inserted into the inner grooves of the stand display to provide the curved backing of the floor display. 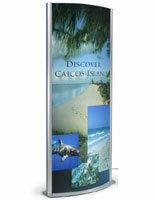 Totem poster stand images are protected by a full length, clear Lexan poster protector, which anchors to the stand display with screws on one of the snap rail bars. This lens folds back and there two clamps in place that hold the sign up while users change signage. 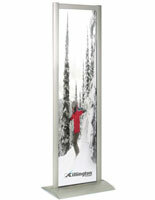 The totem poster stand features an easy to use snap rail bar, which makes changing marketing display posters a cinch. 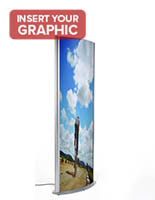 To insert a graphic, flip open one side of the stand display snap rail bar, peel back the clear graphic protector and slide your trade show poster in/out. Once the graphic is secured inside the sign holder grooves, simply reapply the magnetic edge of the anti-glare cover, flip the snap rail closed and you're done! 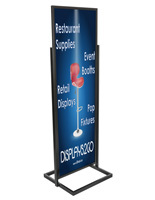 With its attractive curved stand display, economical pricing and sleek European style, the floor display is an essential totem poster stand for any trade show or marketing application. 26.5" x 73.5" x 13.8"